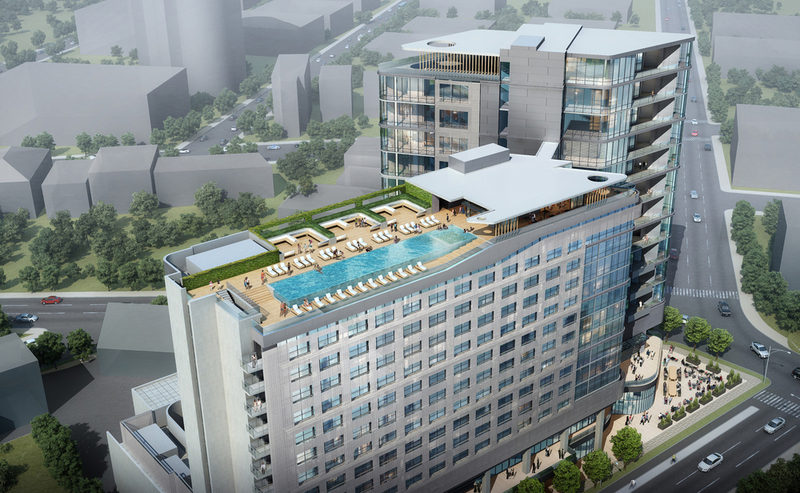 This lifestyle hotel concept houses 240 keys, including 9 celebrity suites and 15 penthouse residences. The massing of the hotel plays off the approach from the nearby downtown, with a dramatic void separating the hotel from the residential units. The public space opens onto the neighborhood and houses a mixture of social settings, food and beverage, lounge and entertainment areas. Just up the stairs, the event level above houses 13,000 square feet of flexible event space. True to Nashville’s musical history, this level boasts a live performance venue and state of the art recording studio. All event and performance spaces have large operable walls that open back onto the city for a celebration that can truly encompass the entire site and extend to the neighborhood beyond during key events. Other amenities include a roof top pool and bar where guests and residents can enjoy skyline views of downtown and the natural landscape beyond.